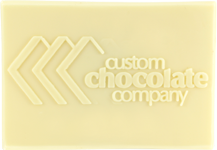 Milk chocolate is our most popular choice and shows relief exceptionally well. This chocolate offers a wide choice of taste sensations, ranging from pronounced cocoa taste to a full, milky taste or a sweet taste with subtle caramel touches. This high quality mild chocolate is produced with blends of premium cocoa beans from the world’s best harvests. Furthermore, Callebaut only uses 100% pure cocoa butter and a dash of natural Bourbon vanilla that accentuates the creaminess of its milk chocolate. If you can't decide which chocolate type to select pick the milk chocolate! Dark chocolate provides very sharp relief but it is not as visible as milk chocolate due to its rich dark color. This chocolate offers a wide choice of taste sensations, with a full bodied flavor. Produced with blends of premium grades of cocoa beans from the world’s best harvests, our dark chocolate is a flavorful addition to any custom chocolate order. Callebaut uses only 100% pure cocoa butter and a dash of natural Bourbon vanilla that provides a slight sweet hint. 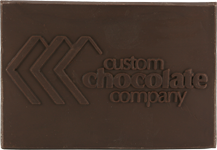 We are pleased to offer dark chocolate as an option for any custom order at no additional charge. White chocolate provides a nice contrast to the dark and milk chocolates, particularly when included in a box set with all 3 chocolate types. 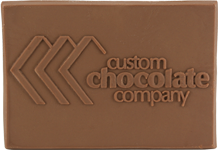 Relief is sharp, but not as visible as milk chocolate due to its lighter color. This chocolate offers a wide choice of taste sensations and is sweet and creamy with subtle caramel touches. It is created from blends of premium grades of cocoa beans from harvests throughout the world. Callebaut only uses 100% pure cocoa butter and a dash of natural Bourbon vanilla that accentuates the caramel hints of its white chocolate.